Details: A very attractive oil portrait of a beautiful young lady in the flamboyant style of circa 1815. It is in fine condition and is relined. Unfortunately, neither the lady’s name is known, nor its provenance, so the work can only be offered as ‘Circle of Harlow’. A portrait painter of enormous promise who died before his full potential could be realised. George Henry Harlow(1787-1819) studied under Samuel Drummond and Sir Thomas Lawrence until they fell out when he was asked to paint an inn sign by Lawrence, but then put his own initials on it; guaranteed to displease his boss who was being paid for doing the painting himself! He was considered by Lawrence to be his most promising pupil and, despite the falling out, Lawrence continued to sing his praises as an artist. He was building up a very promising practice when he died, improbably, of mumps, aged 31. He is buried under the altar of St. James’ church, Piccadilly, London. He exhibited 45 works at the Royal Academy between 1804-18 and at the British Institute of Artists. He painted portraits of HRH the Prince of Wales and the Duke of Sussex, also Sir William Beechey and Fuseli. He visited Rome in 1818 and was elected Academicien of Merit at the Academia di San Luca, just before he died. This lovely portrait is of an unknown lady and displays all of Harlow’s characteristics, especially his use of colour which owed much to Lawrence’s tutelage. 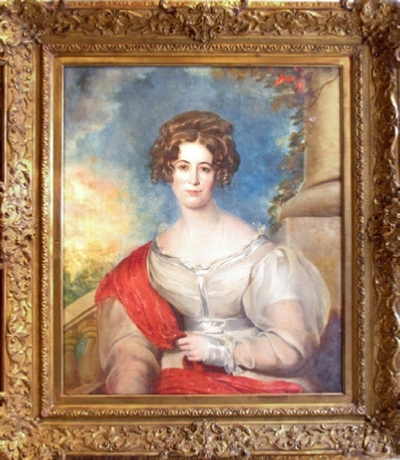 A very fine and attractive portrait in a very good frame of the period.